Students who create Silver International include some who take a journalism class for credit and some who volunteer to type or write articles during their lunch peroids. Pictured are (front) Marcia Martinez,Abhishek Sinha and (back) Adene Bekele. This year Silver International newspaper is celebrating its twentieth anniversary. For the last twenty years more than 200,000 copies of the newspaper have been given or sold to students, teachers, and others in Blair and other schools around the world. Silver International was founded by Mr. Joe Bellino the ESOL director at Blair in 1986. Mr. Bellino started this newspaper because he thought that sharing information about countries and different cultures is a good idea. Mr. Bellino said. That newsletter and improving computer technology encouraged him to help a small group of students to create their first issue in December 1986. Even though Silver International is published by the international students at Montgomery Blair High School, Blair is not the only school that it serves. This newspaper also has subscribers and gets articles to publish from other schools in the nation along with students in other countries. This year schools in Germany, India, and Pakistan have subscriptions to Silver International. But in past years, schools in Guinea, Burma, Thailand, Indonesia, Peru and Cambodia have also received it. According to Mr. Bellino, students make a lot of progress in English through this newspaper. “One thing I’ve learned with this newspaper is the more students write the better they get,” he said. 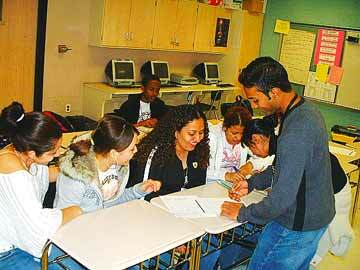 Silver International has actually opened a path for the ESOL students to be recognized in the community. “I think it helps second language students have a voice and a platform to express themselves,” Ms Mena an ESOL teacher at Blair said. “I think it’s a great opportunity for ESOL students to get published. I enjoy reading it because I like to see who has written and what they have written,” Ms Tomesek another ESOL teacher said. Silver International also gives student writers a feeling of pride. “Silver International is a wonderful paper. I have always felt great when I actually saw my article in the paper,” Xiowen Hu a Blair graduate from last year said. Mr. Bellino once told a story about a phone call he received a few years after Silver International started. One day after school he was called to go to the office to take a phone call from a teacher in Arizona who had a subscription to the paper. As he walked to the office, he wondered what the teacher would be calling about. The teacher had sent letters, but hadn’t called on the phone. “I had to call you,” the teacher said, “to tell you an amazing thing that just happened.” She started to tell Mr. Bellino about one of her students whom she referred to as a “do nothing.” He would come to school but rarely completed assignments. However, she had noticed that he was starting to do his work after a poem he had written was published in Silver International.